The cut line was at +1 when the day was done after the second round of the 117th iteration of the U.S. Open, this year in Erin, Wisconsin. 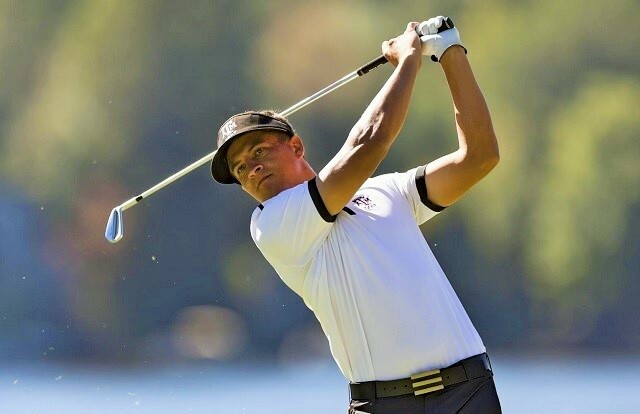 Among the survivors were two of 14 amateurs who teed it up this year: Scottie Scheffler out of the University of Texas at -1, and Cameron Champ of Texas A&M only two behind the leaders at -5. Seeing either Champ or Scheffler become the sixth amateur to roll in a winning putt in the history of the championship is unlikely, but who knows? In any case, the time has come to put your bets on the bar and start rattling off the names of the five amateurs who have prevailed in the U.S. Open, before we give it all away. The last time it happened was in 1933, so maybe an amateur is due. But the only other hints are that all five amateur Open winners also won the U.S. Amateur title at least once in their golfing careers, and none of the five ever fully turned pro. Four of them are in the World Golf Hall of Fame. First off, you get no points whatsoever for coming up with the two obvious choices. But if you come up with all five that may be just as bad, suggesting you need to get a life and stop thinking about golf all the time. I was prompted to look into all this from a public relations release that came my way, noting that the 14 amateurs in this year’s Open are all also signed up to compete in this year’s U.S. Amateur, to be played in August at the Riviera and Bel-Air country clubs in California. 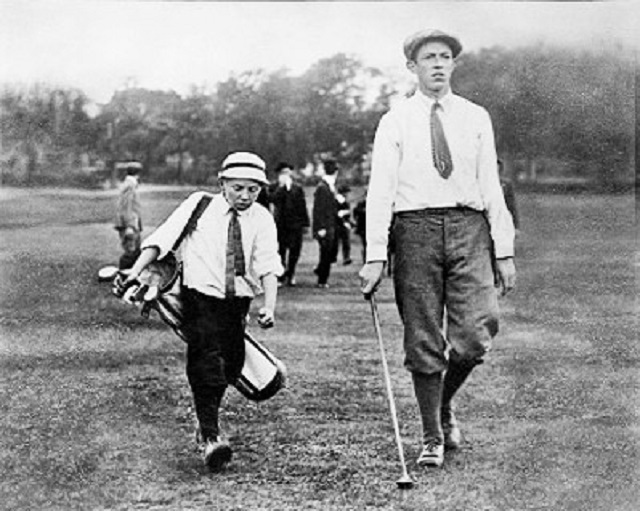 The first obvious choice, and the first time an amateur win in the Open occurred, was in spectacular fashion in 1913, when Francis Ouimet stunned the world of golf in general and Harry Vardon and Ted Ray in particular when the young caddie bested the two English greats in an 18-hole playoff at The Country Club in Brookline, Massachusetts. The match was the subject of book and movie of the same name, The Greatest Game Ever Played. Ouimet won the U.S. Amateur the following year, and then again sixteen years later, in 1931. In 1914 he beat Jerome Travers in the finals. Had Travers prevailed, it would have been his fifth U.S. Amateur title and third in a row, but that was the end of his run. 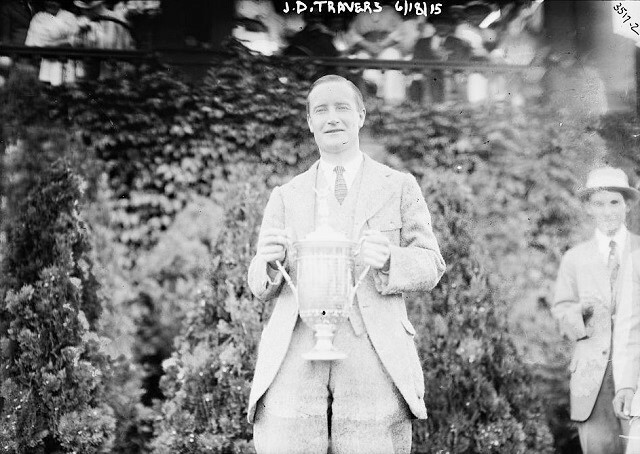 But Travers, not to be outdone by Ouimet, became the second amateur to win the U.S. Open, at the Baltusrol Golf Club in Springfield, New Jersey in 1915, by one stroke over Tom McNamara (best known in these southern Vermont parts as the original designer of the Brattleboro Country Club). Travers decided to quit while he was ahead, and retired from competitive golf after the Open. He did later became a teaching pro, but is remembered for his many amateur victories. The very next year, 1916, amateur Chick Evans went around the Minikadha Club in Minneapolis in the then-record pace of 286 (-2), a record that lasted for twenty years. It was a wire-to-wire win, a two-stroke margin over runner-up Jock Hutchison. It was a good year for Evans. Three months later he became the first player to win the Open and the U.S. Amateur in the same year. He would take the latter title again in 1920. He would go on to play in 50 consecutive U.S. Amateurs and found the Chick Evans Scholarship Program, which is still alive and well today and helping to fund the college educations of hundreds of caddies each year. The second obvious choice is the great Bobby Jones, who won the Open four times, in 1923, 1926, 1929 and 1930. Like Travers, Jones retired from competitive golf after his last Open victory because, really, what else was there to do? Jones had also won the British Amateur Championship that year and the Open Championship. After the U.S. Open win at the Interlachen Country Club in Minnesota, Jones also went on to win the U.S. Amateur (for the fifth time) and cap the Grand Slam of his day, better known then as the Impregnable Quadrilateral. 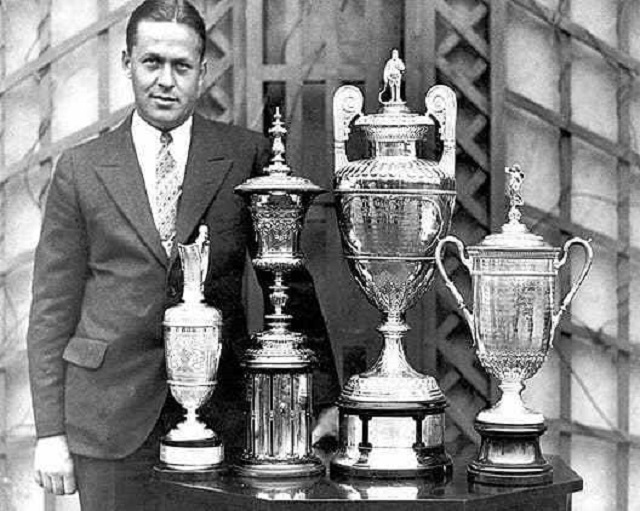 Bobby Jones and his four trophies of the Impregnable Quadrilateral. Perhaps the least obvious choice is the 1933 victory by Johnny Goodman, the one player in the group who is not in the World Golf Hall of Fame, as his career was cut short following World War II after breaking his arm in a car accident. 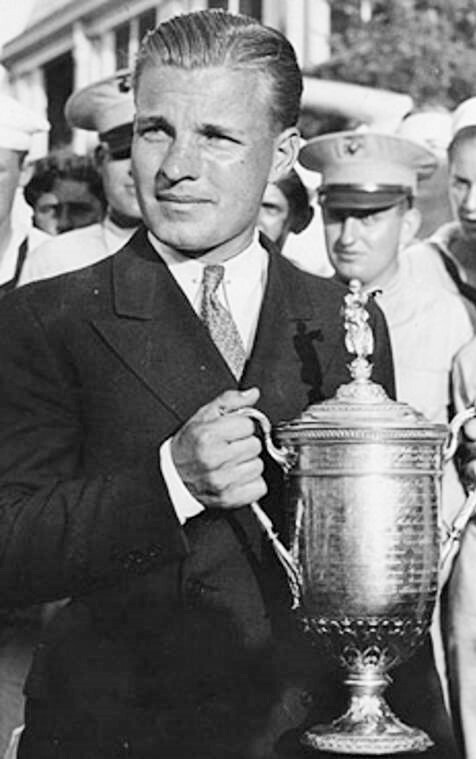 But Goodman was a solid player in his day, besting Bobby Jones in a match in the 1929 U.S. Amateur at Pebble Beach, prevailing over Ouimet in the 1932 tournament, and over everybody in the 1937 tilt, paired with Ray Billows in the final. 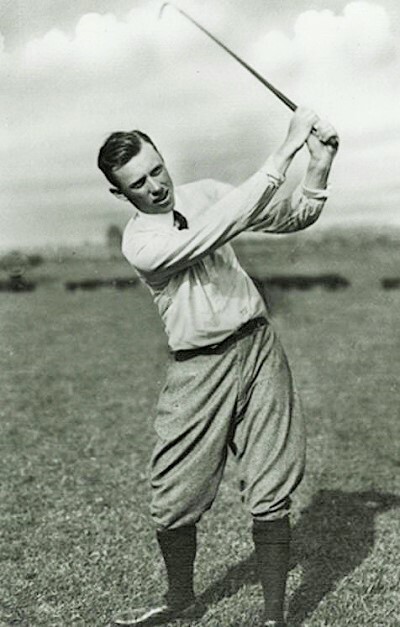 But it was 84 years ago at the North Shore Country Club in Glenview, Illinois that Goodman entered the record books as the last amateur to win the U.S. Open, a one-stroke victory over Ralph Guldahl, and thereby giving you a chance to win a beer at the bar. The closest anyone has come since Goodman? Some guy named Nicklaus, who was the leader midway through the final round of the 1960 Open, and finished in second, two strokes behind some guy named Palmer.